Marilyn Ann Owens. Born in Durham, England. Lives and works in Telemark, Norway. Education: Sunderland University (Department of Fine Art), Newcastle University and Oslo University. 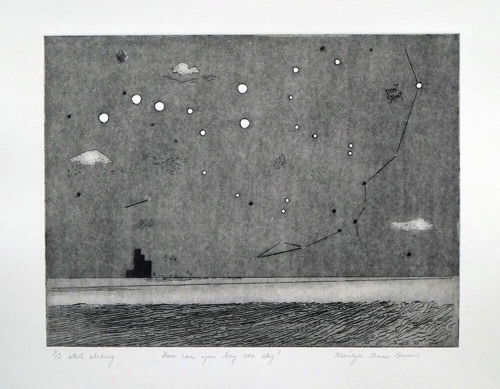 Owens is a painter and printmaker and has taken part in many exhibitions and one-woman shows, both in Norway and abroad. Her works have been purchased by the Nasjonalmuseet for kunst, design og arkitektur, Oslo, the Museet for Samtidskunst, Oslo and the Norwegian Arts Council. Owens has also completed many public commissions. Main group Read Moreexhibitions: The National Annual Autumn Exhibition, Oslo; “Concerning Prints” - The Nordic Printmakers Union touring exhibition in Norway, Finland and Denmark; The 4th International Biennale, Lodz, Poland; “8 Norwegian Female Printmakers, Hasselby Slott, Stockholm, Sweden; “Figurative Art North”, Laing Art Gallery, Newcastle, England. Solo shows: Telemark Art Centre, Skien, Norway; Norwegian Printmakers, Oslo, Norway; The Society of Norwegian Painters, Oslo, Norway. How can you buy the sky?